Here's a thread for news concerning the heart of Miami. I'm going to try to get some pictures of this one. Anybody else plan on going? Starting Sunday, a Miami landmark built in 1926 will turn - temporarily - to rubble. On that day, at about 8 a.m., Cabi Developers is to implode the 17-story Everglades Hotel in downtown Miami to make way for a new, two-tower condominium. The developer said 50 pounds of dynamite and 137 pounds of steel cutting charges will implode the Everglades Hotel, clearing land for Everglades on the Bay. First responders are to take advantage of the blast, with a multi-agency emergency services training drill and a fire drill. Also, rescue and hazardous materials teams, with South Florida Urban Search and Rescue Team (USAR) and the City of Miami Police Department, are to train in conditions made to simulate the World Trade Center disaster. Due to safety precautions, the developer said various downtown roads will be blocked off starting at 7 a.m. the day of the implosion. At 7:30 a.m., the area is to be secured, with an implosion ceremony with the developer and city officials beginning 25 minutes later. That'll be awesome to see! From the pics I've seen, it's an ugly building and the Everglades on the Bay project will be a great replacement! Yeah, I'm normally all for saving unique historic structures, but the Everglades time, has come and gone. RIP. I'm definately looking forward to the new wall of towers being completed along Biscayne Blvd. Here's some pics stolen from the net of how it was. Here today, gone tomorrow. (Miami-Dade County, FL) -- Due to the demolition of the Everglades Hotel in Downtown Miami this Sunday, January 23, 2005, Metromover service will be temporarily closed between 7:30 a.m. and 9:00 a.m. During this interruption, free shuttle buses will operate along the Metromover alignment, which includes the Inner, Brickell and Omni loops. All buses traveling northbound on Biscayne Boulevard between E. Flagler Street and NE 5th Street will detour to NE First Avenue. All buses traveling southbound on Biscayne Boulevard between NE Sixth Street and SE First Street will detour to North Miami Avenue. This bus detour will begin at 6:00 a.m. until 10:00 a.m. on Sunday, January 23, 2005. ^Those are some nice pics of downtown. I like those blooming trees, that are lining Biscayne Blvd, I think. I hope to find a video online of the implosion. Maybe The Herald will have something on their site. That's Biscayne, Urban_Legend -- good eye. Any of you guys going out to take pics? I plan on being there, camera at hand... Brickell has said he will be there. Some interest has also been expressed on SSC. I'm hoping I can find someplace to stand with minimal obstructions. Personally I've always been fond of this building. In the 1980s, when Biscayne Boulevard had deteriorated into a shabby, neglected strip, the Bacardi company was urged to move its North American headquarters to a nicer stretch, in Coral Gables. But the Bacardi brain trust, as strong-willed as the Cuban family of rum-runners, artists and freedom fighters that founded the company, said no. Good thing. Today, the Bacardi buildings rise majestically above a vibrant, reborn boulevard. And the company, which says its flagship brand of rum is the world's best-selling spirit, is being honored by the Wolfsonian Museum-Florida International University for its contribution to architecture, as embodied by the two Miami buildings that went up on the boulevard in the '60s and '70s. Each year, as part of its Very Wolfsonian Weekend fundraiser, the museum hosts a party at a local building or buildings whose architecture is deemed distinctive but underappreciated. Wolfsonian director Cathy Leff, who scheduled tonight's party at Bacardi, said the buildings, with their blue tile, abstract designs and ornate stained glass, fit the bill. They constitute ''one of the best examples of how good architecture defines our city,'' she said. For Bacardi, a company not known for spending money to polish its corporate image, tonight is a coming out party, of sorts. Port of Miami Bridge...great location to watch the boom boom! Will "they" (police/security) let you walk on that bridge? Once celebrated, then stripped of her charms, scorned and just about forgotten, a grand old Miami lady will be laid to rest Sunday. 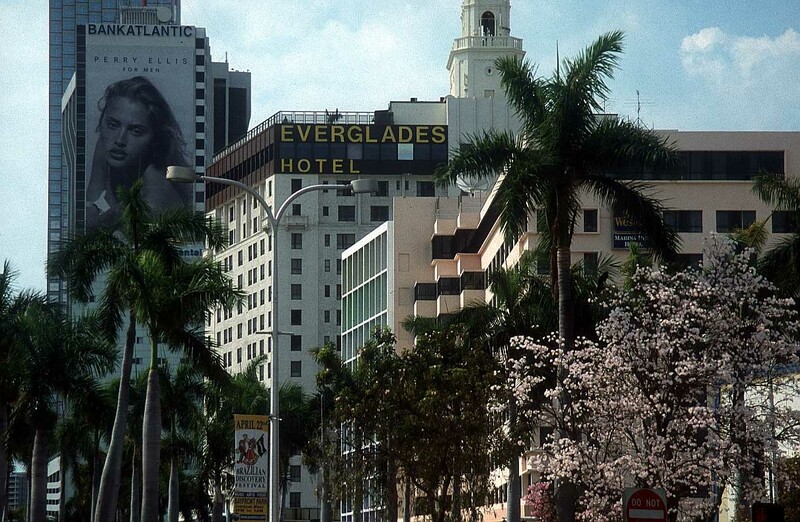 R.I.P., Everglades Hotel, 1926-2005. Victim of old age, neglect and, oh, about 137 pounds of potent explosives strapped to her innards. Once the city's largest and most luxurious hotel, the 16-story Everglades will be brought down in a controlled implosion early Sunday to make way for a colossal condo project. With it will go the last vestiges of the row of 1920s skyscraper hotels that, along with the Everglades' close architectural cousin, the Freedom Tower, defined downtown Miami's skyline for 50 years. The Everglades, 244 Biscayne Blvd., will suffer the same indignity accorded its one-time companions, the storied Columbus, McAllister and Alcazar hotels, all reduced to a pile of rubble, unlamented by all except those who care about Miami's history. Historians believe only one other of the original hotel row survives, altered far beyond recognition. Behind the greenish tiled facade of the Riande Continental Hotel stand the bones of the old Watson Hotel, historians say. But there just wasn't that much of the original Everglades left to make a campaign to save it worthwhile, preservationists acknowledge. More than one effort at modernization had denuded the hotel's exterior of its Mediterranean Revival detail, including the towering cupola that once crowned it. It was sawed off in 1961, leaving a stump atop the building. In fact, said City Commissioner Johnny Winton, what was left was simply ugly. Its replacement -- twin towers with more than 800 condo units -- will be a distinct improvement, he said. The new high-rise will retain the Everglades name in tribute to the old. What the new Everglades won't have is the astonishing and colorful history of its predecessor -- host to many a visiting grandee, originator of the first TV transmissions in Miami, and role-player in the downfall of legendary Teamsters Union leader and alleged mobster Jimmy Hoffa. It was also among the first hotels in the South to open its door to black guests. Upon its opening, The Herald pronounced it ''majestic,'' second in architectural distinction only to the then-new Dade County Courthouse , still standing tall on Flagler Street. Built for $3 million, the Everglades was one of several local buildings modeled after the Giralda tower in Seville, including the old Roney Plaza in Miami Beach, the Biltmore Hotel in Coral Gables and the Freedom Tower. The Everglades was completed just in time for the disastrous 1926 hurricane, which washed bay waters over its ground floor. For a while it housed people made homeless by the storm. Its rooftop Skylight Room, a popular site for dances and banquets, provided stunning and never-before-available views of Biscayne Bay. By the 1950s, the new hotels in Miami Beach had begun eclipsing the downtown Miami hotels, which could not compete with sand and sea, said historian Paul George. The Everglades' owners tried to adapt. And therein lies quite the tale. To the rescue came Teamsters head Hoffa, with a $1 million mortgage and a $3 million loan from the union's pension fund for an expansion and renovation, resulting in radical alterations. ''There was no sense at all of historic preservation then,'' George said, chuckling ruefully. So in 1959, a roof pool -- then a novelty -- and nightclub were added, requiring construction of a new support structure astride the building. The pool had a glass tank where a ''mermaid'' performed, drinking and smoking underwater. In went a convention hall and a parking garage, too. Down came the 30-foot steel-and-concrete cupola. When the hotels' owners ran into financial trouble shortly afterward, the Teamsters bought the Everglades at the courthouse steps. In time, Hoffa was convicted of taking kickbacks in return for arranging the loans to the Everglades and other properties. He famously disappeared shortly after his release from prison. By the time the Teamsters unloaded the Everglades in 1978, the hotel was a faded relic, overshadowed by the downtown office towers erected that decade. It enjoyed a last brush with notoriety in 1982, when the confabulating Sheik Mohammed Al-fassi and his entourage moved into 25 rooms for a couple of weeks. The management claimed they left $40,000 in unpaid bills. The Everglades hung on for a couple more decades after that, catering to budget-minded visitors from Latin America and, most recently, hosting the sales center for the condo that will supplant it. In 2002, a budget hotel chain struck a deal to buy the Everglades and restore it, but walked away after concluding it would be too expensive to do so. The next year, the Everglades ceased operating as a hotel for good. ''It had a great run, it really did,'' historian George said. N Miami Ave on the west. Latitude on the River, a 452-condo tower at 615 SW Second Ave., Miami, broke ground Jan. 12. A homeowners association vote to not pursue historic designation has brought a simmering debate to the fore: Is historic designation for neighborhoods a boon or a nuisance? For some, living in a historic Miami neighborhood lives up to the hype. The houses are old, but chic. Homeowners take pride in the label, which carries prestige. Small homes fetch big money, while strict rules protect the neighborhood's original look and feel. But for others, having ''historic'' slapped on their neighborhood means extra bureaucracy that can turn a simple thing like replacing windows into a six-month mission. Homeowners in the Upper Eastside neighborhood of Belle Meade decided to make ''historic'' history -- recently voting 82-63 against pursuing official designation of their community by the city. Belle Meade's association is the first to resist the designation since the city's original historic district, Morningside, was designated in 1984. The city now has seven such districts. The Belle Meade vote doesn't bar the city's Historic and Environmental Preservation Board from designating the community as historic, but makes it more unlikely since the City Commission would have final approval. Residents of Morningside and other designated neighborhoods, most in Northeast Miami, credit the protection of preservation laws with reversing blight while staving off intrusive development. But the Belle Meade vote, which comes amid unprecedented redevelopment along the Biscayne Boulevard corridor, brought to the fore a debate over what some say are the drawbacks of historic designation. Some in Belle Meade say designation is unnecessary. Even without it, Belle Meade has already seen a sharp rise in property values. Opponents fear designation could stall further increases, and they contend that nitpicking by the city has led to higher costs and unnecessary delays in approvals for renovations in neighboring districts. Some preservation backers say Belle Meade is making a mistake. They say the rules are reasonable and keep inappropriate construction like oversized ''McMansions'' out. Rising land values could now induce teardowns of old homes, they fear. The benefits designation brought to neighboring Morningside are clear, said Ana Gelabert-Sanchez, director of Miami's Planning Department. ''It has experienced increased property values along with a binding sense of community,'' Gelabert-Sanchez wrote in an e-mail response to Herald questions. Preservation laws helped residents defeat a proposed oversized mansion in the neighborhood two years ago, said Rod Alonso, former president of the Morningside Civic Association. ''They got the owner to agree to build a smaller house because the one he had proposed was out of scale with the neighborhood's historic character,'' Alonso said. But Kerkhof and others in Belle Meade aren't buying it. To them, the cons outweigh the pros. The push for designation started in January 2004, when a Belle Meade resident approached the city's Historic Preservation Office. The idea was at first supported by the homeowners association, until Kerkhof wrote and circulated a flier titled ''Historic or Hysteric?'' It urged residents to fight the designation. Henry ''Hank'' Bonis, who joined Kerkhof in the fight, said he wants to ensure designation doesn't come up again. Because the city lacks specific guidelines for what constitutes acceptable repairs and renovations, homeowners have a hard time figuring out what's required. And the city's decisions often seem arbitrary, he said. He and other opponents say historic designation can be unfair to property owners who can't afford the typically higher cost of making historically authentic repairs or renovations. That has been the case for some in the up-and-coming Buena Vista East neighborhood, which was designated a historic district in 1987. New residents who paid half a million dollars for bungalows are living next to longtime residents who paid a fraction of that. Stephan has bought and restored five homes in the neighborhood, including the 1924 home where she lives now, and has been before the preservation board several times. She found the board, which has the final word on approvals of repairs or additions, to be flexible. But she said the city's preservation officer, Sarah Eaton, who makes the initial decisions, can be overly strict and inflexible. Eaton and the city say the vast majority of applications are approved quickly. Those cases that stretch out longer often involve homeowners who are adamant about doing work that is historically inappropriate, Eaton said. And many end up being happy when they realize how good authentic work makes their home look, she said. Great model, the downtown area will be a completely different landscape when the proposed projects are completed. What's the project in red, just north of the port?